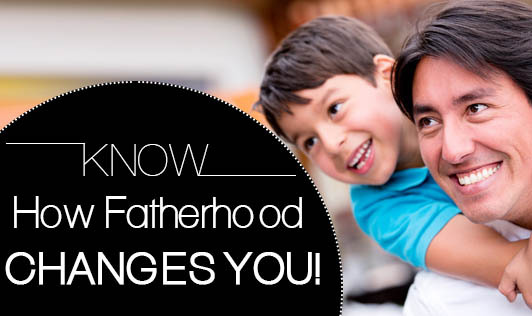 Know How Fatherhood Changes You! Becoming a father, especially for the first time, changes a lot of things in a man's life. It changes you as a person. You become more mature while you interact with your wife, with the baby, with the society. You tend to think more about your baby than yourself. Your needs become secondary to the baby's needs. The money which you earn, gets a deeper meaning, it directly connects to the baby's future. You become more protective towards the baby, and feel responsible for everything related to her. The presence of your baby reduces stress you were feeling when the baby was not around. Your body language changes suddenly! Your nursing abilities are enhanced once you start helping your wife in various baby-nursing activities. You start taking up household chores on your own, just because your wife needs to feed the baby. This helps your relationship between your wife and you to get stronger and mature. You try to become more social than you were earlier. This improves your confidence as well. Your brain starts thinking in a multi-directional way. You start feeling that the ‘dad's' role suits you well. Overall, you change for the good... thanks to your baby, who usually only eats, sleeps, cries, babbles, laughs and still remains the most important person in your life!